Fancy a strong Nordic touch or wanting to recreate those gorgeous IKEA showrooms that you eventually had to walk away from? Where everything seems out of place for purists and mashed together but just somehow fits? 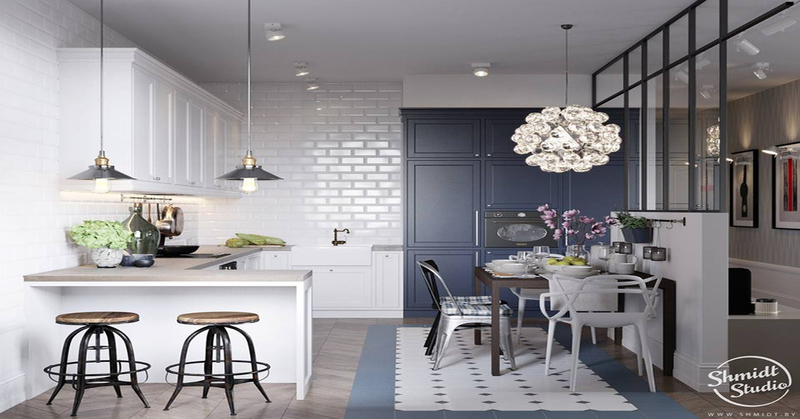 The beloved Scandinavian style is known for its comfort, coziness, and eye-pleasing aesthetic. Here in this 3-bedroom family apartment, we can see understated but bold, modern furniture against a simple colour scheme. In the living room, a bold, teal couch spreads out across a sea of greys, browns, and whites. Bronzes can also be seen while quirky light fixtures work to tie everything together. Nature is cooperated with wherever and whenever thinkable. Natural light is taken advantage of as much as possible and strong black lines are strategically applied to add contrast and power. In the children’s bedroom, a surprise of pastel pink greets us with a nice, upbeat change to the main teal scheme the rest of the apartment has going on.